Plus Size Costume Shop carries a full line of professionally hand-made Halloween costumes, Renaissance garb, Christmas costumes and historical clothing in sizes 0X (14/16W), 1X (18/20W), 2X (22/24W), 3X (26/28W), 4X (30/32W), 5X (34/36W), 6X (38/40W), 7X (42/44W), 8X (46/48W). This great Renaissance costume would work as Rapunzel from Tangled or as Juliet from Romeo and Juliet. It is more casual than our deluxe Rapunzel, being made out of cotton instead of satin. 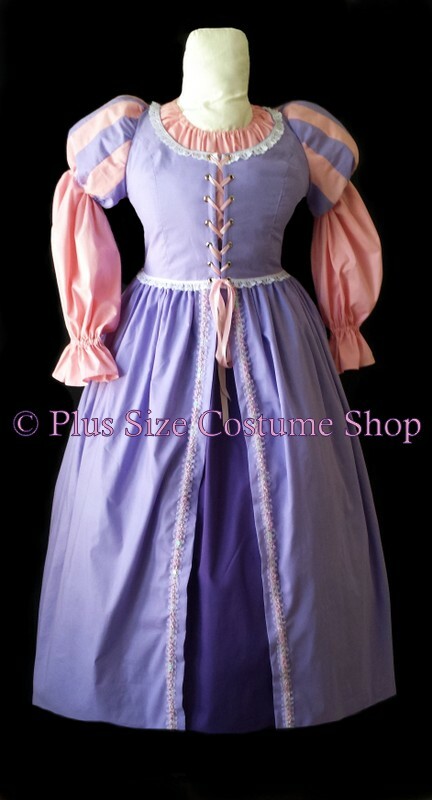 If you are looking for our Deluxe Rapunzel costume, please click here. 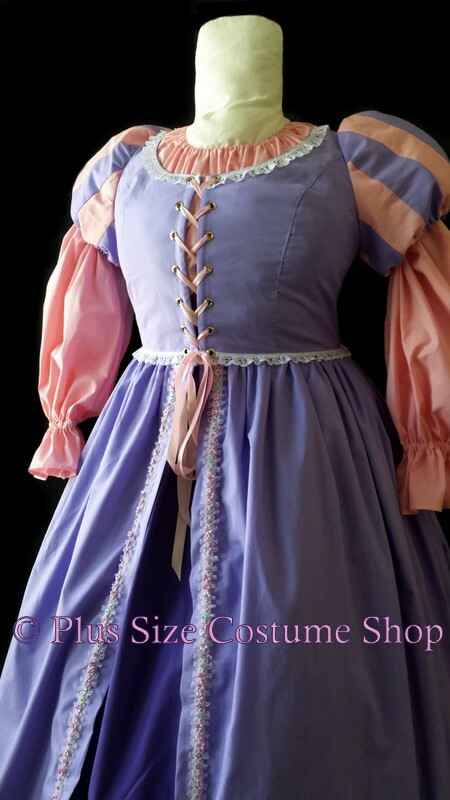 The overdress is made of lavender cotton and has attached pink and lavender striped puff sleeves. The neckline and waistline are both embellished with white lace and there is a flower trim down the overskirt slit. The peasant shirt is long-sleeved and made of pink cotton. It has elastic in the neckline and sleeves for a comfortable fit. The skirt is made of purple cotton. The skirt has an elastic waist for comfort. The skirt will be hemmed at 36" in length (approximately ankle to floor length on someone of average height) unless a specific shorter or longer length is requested.